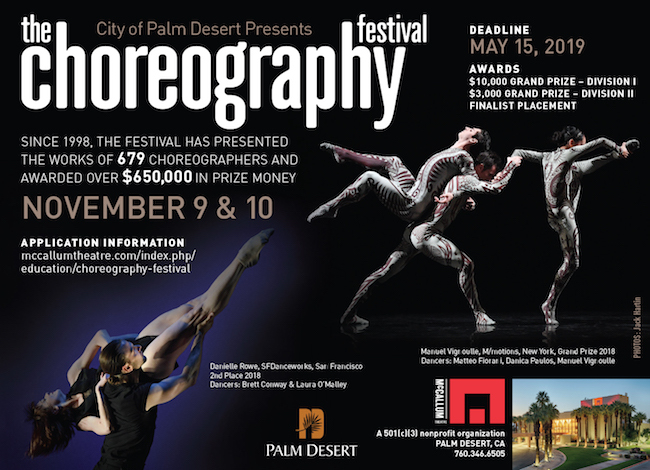 The 22nd Annual Choreography Festival will be held November 9 and 10, 2019 by the McCallum Theatre in Palm Desert, CA. 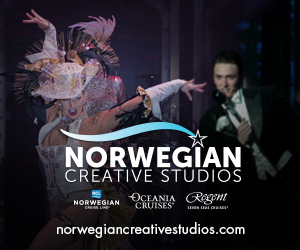 Choreographers may now apply online through May 15 for a chance to participate and possibly win monetary awards. McCallum Theatre’s Choreography Festival was launched in 1998 to support choreographers in their career endeavors, create new venues and audiences for dance presentation, and support new trends and directions in dance via the recognition of dance-making at the highest level of artistic expression. The festival presents work from choreographers working with professional dancers of seasoned artistry and fully mature technique (ages 18 and up - Division I) and choreographers who are working with pre-professional dancers from aspiring and emerging companies, colleges and studios (Division II). Division I awards a $10,000 Grand Prize and a $3,000 Second Place Prize. Division II offers a $3,000 Grand Prize and $1,000 Second Place Prize. All finalists who participate in the festival performances receive Finalist Stipend Awards ranging from $1,250 for ensembles to $500 for solos in Division I and $625 to $250 respectively in Division II. Choreographers interested in learning more about the festival and to see submission requirements should visit www.mccallumtheatre.com.